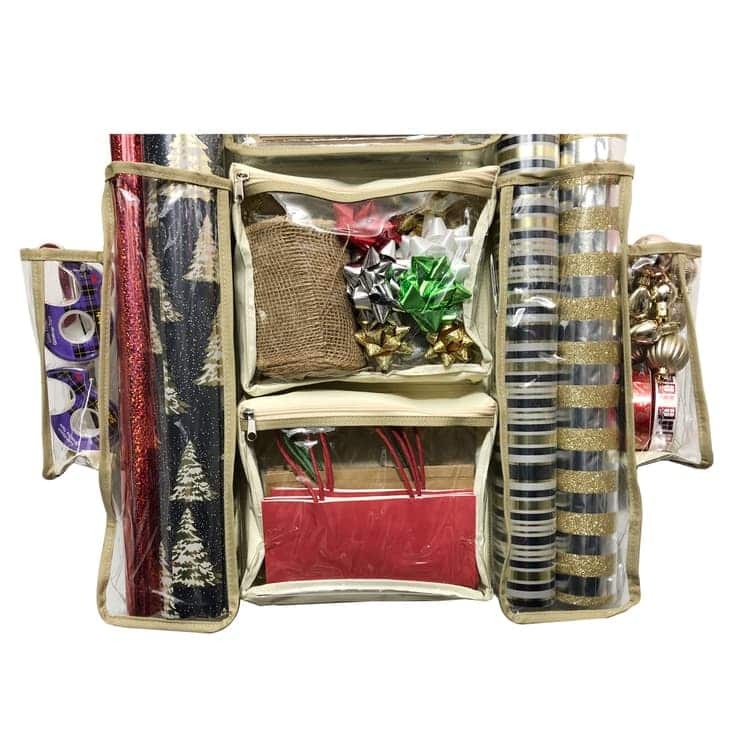 Tired of having to hunt through your home to find everything you need to wrap a present? 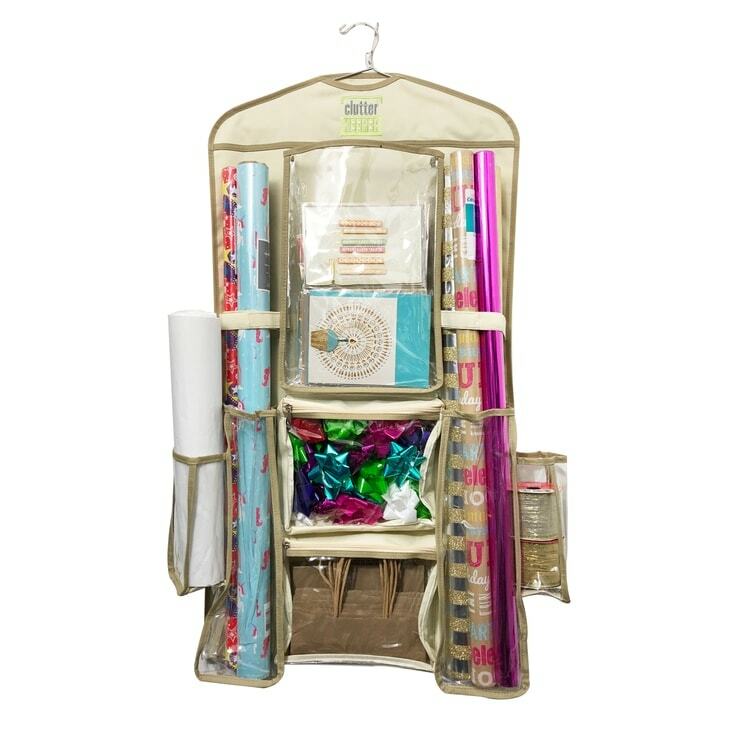 Get organized with the Clutter Keeper Deluxe Hanging Gift Wrap Storage Organizer. 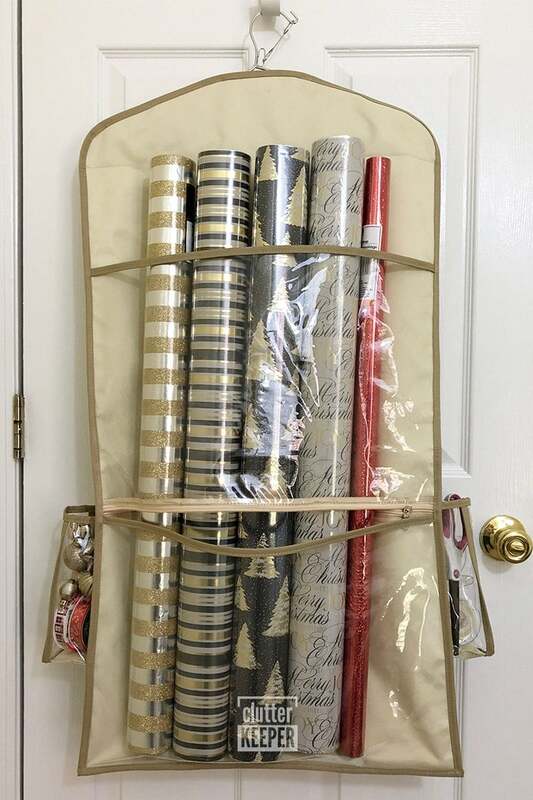 Conquer the clutter in your closet or under your bed caused by all your gift wrapping supplies. 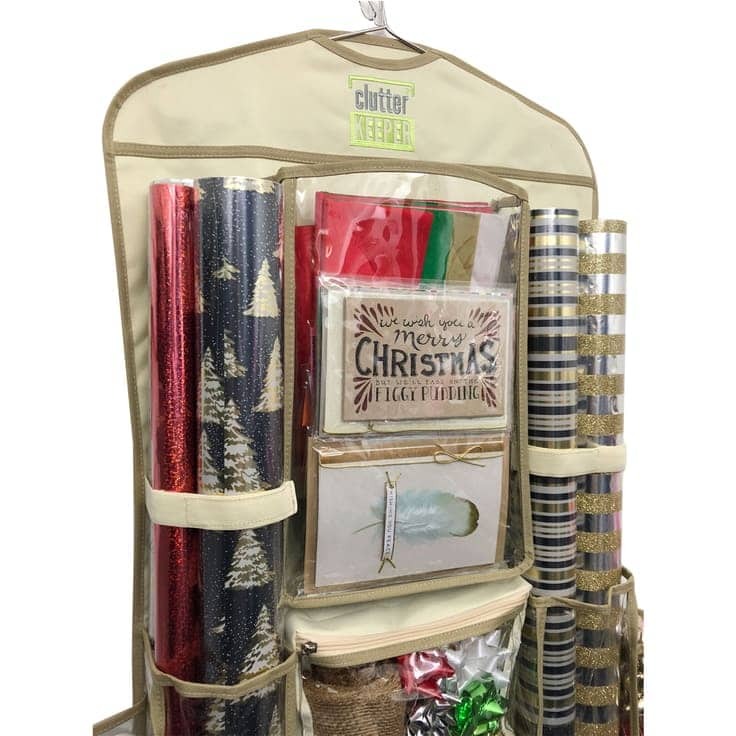 The Clutter Keeper Deluxe Hanging Gift Wrap Storage Organizer is a high quality product designed to hang vertically from a standard closet rod or on a door hook so that you have everything you need to wrap presents quickly and easily. 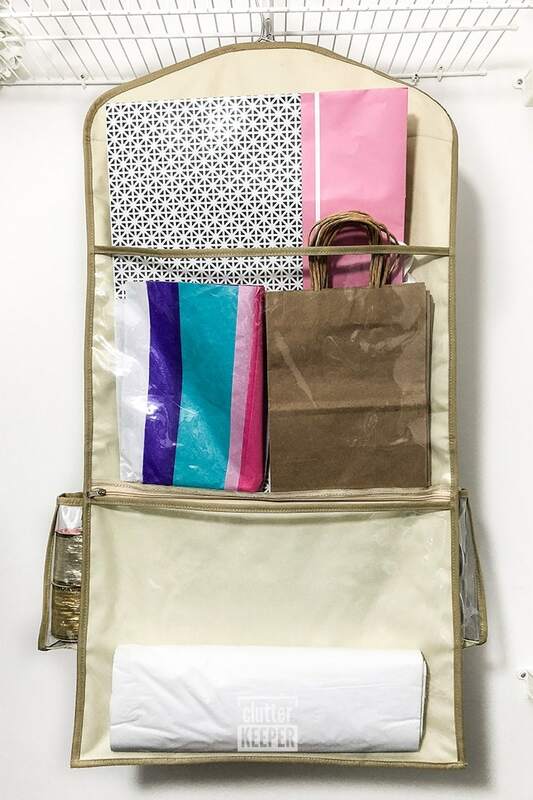 This product is temporarily out of stock. Sign up for our weekly newsletter and we’ll notify you when it’s available again plus we’ll send you an exclusive discount to thank you for your patience and understanding! 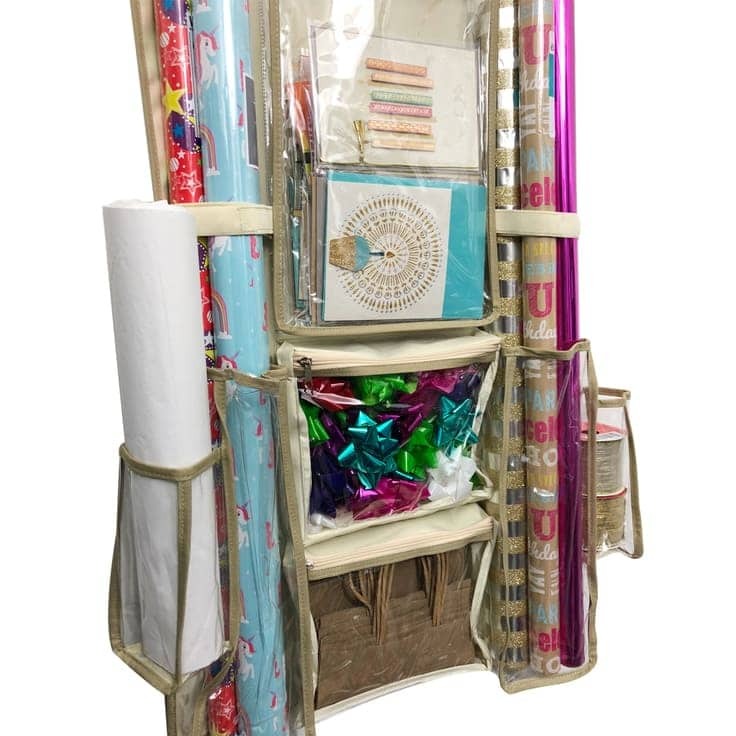 This two sided extra wide hanging organizer is 37” x 19.7” and designed with 9 clear pockets to store all of your ribbons, bows, wrapping paper rolls, greeting cards, tissue paper, tape, gift bags and scissors to help you stay organized. 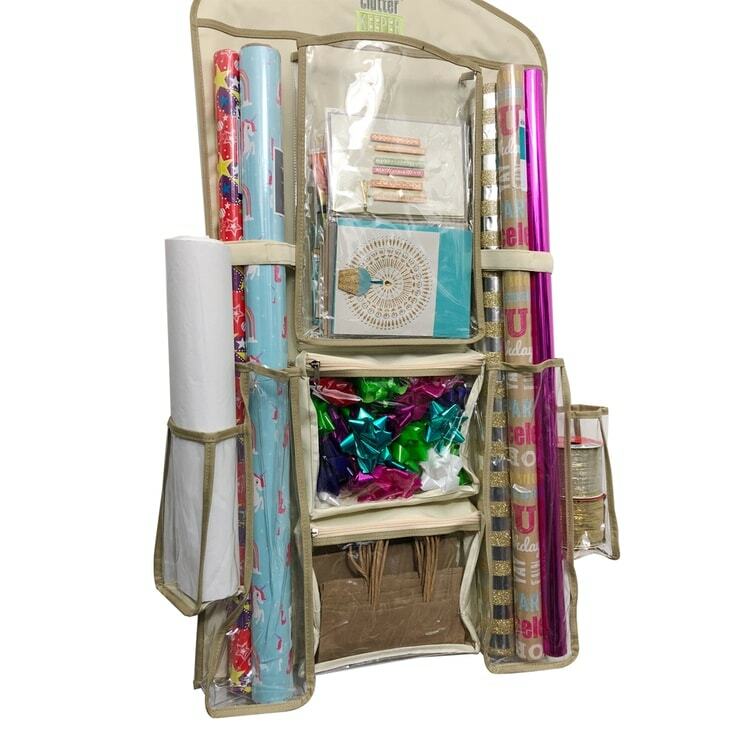 The gift wrap organizer fits neatly in a closet alongside storage boxes, clothes, etc. 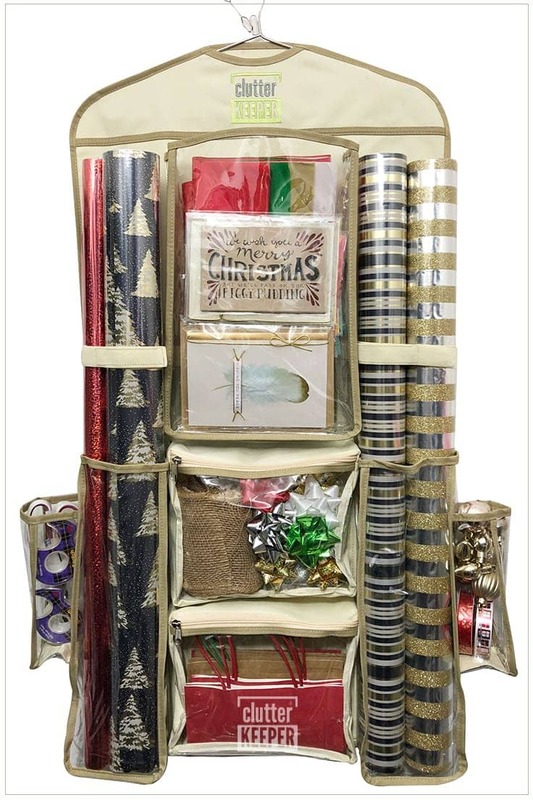 Yet it’s roomy and durable to hold multiple rolls of wrapping paper. 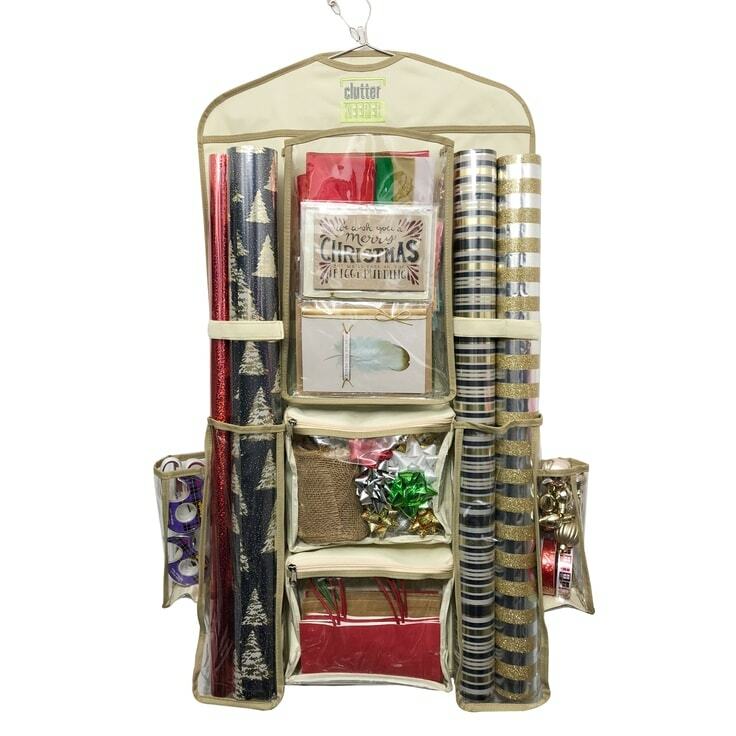 Our unique Smart Pocket System gives you two options for maximum wrapping paper storage. 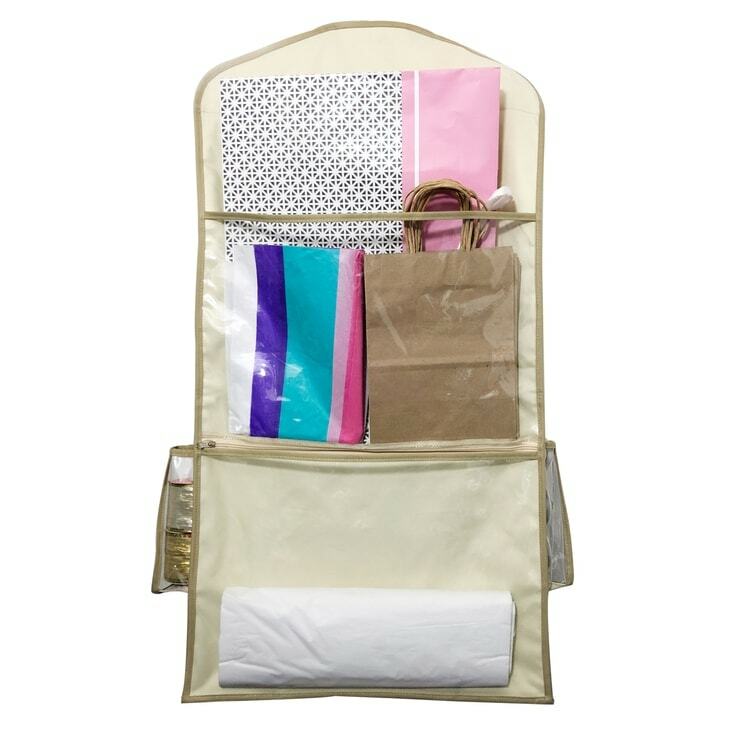 On the back side of the hanging organizer, there’s a horizontal zipper across the bottom of the upper pocket. 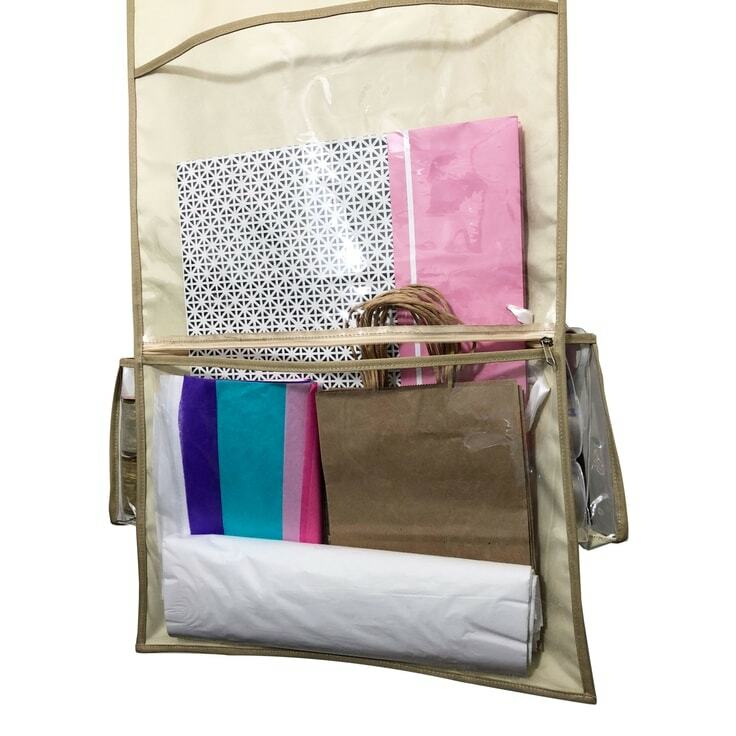 If you zip it closed, you have two extra wide pockets to hold all of your gift bags and tissue paper. 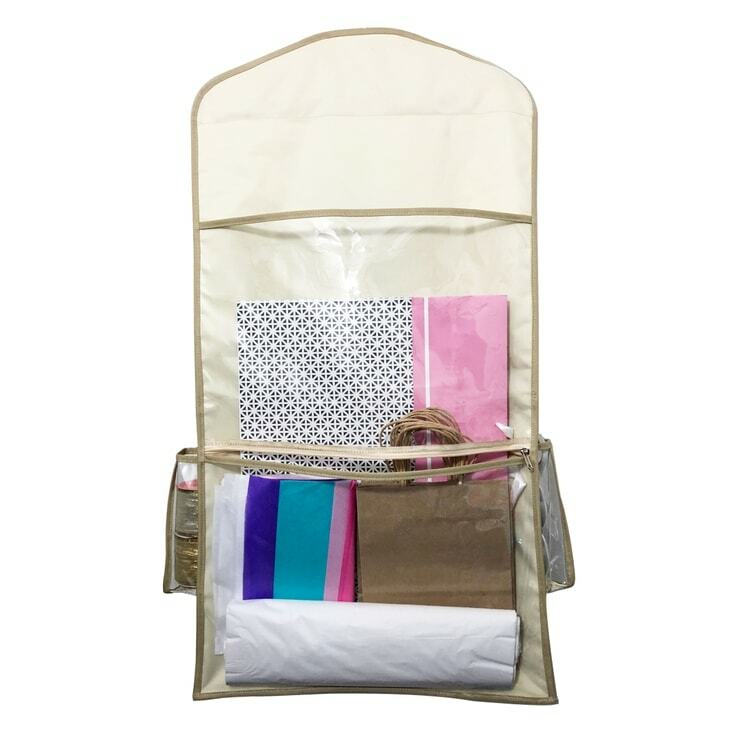 Or you can choose to unzip the bottom of that upper pocket to transform the back side into one super long Smart Pocket. 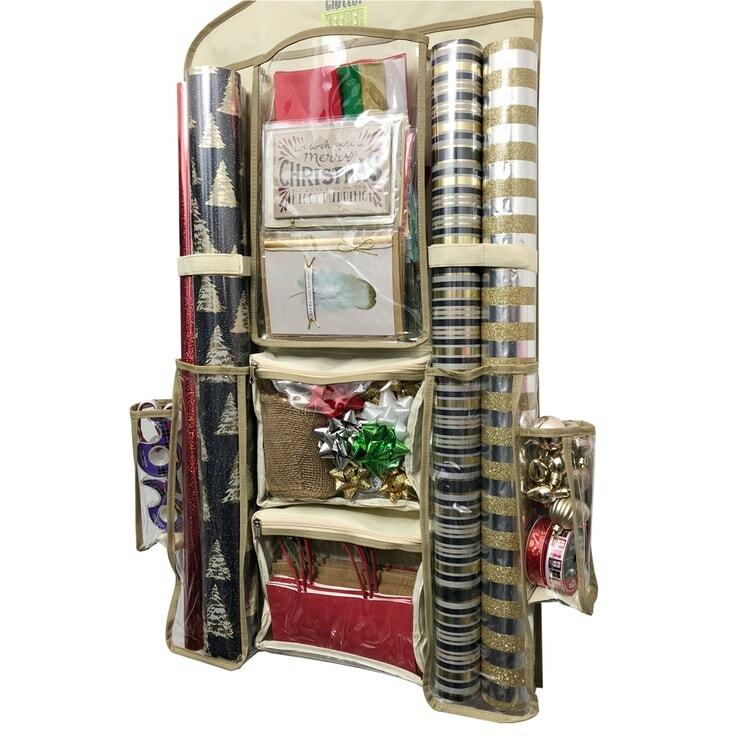 This allows large wrapping paper rolls to pass through and significantly increases your storage capacity.